From afar, it looks and sounds like a regular recreational baseball game: the crack of the bat, the cheering from the bench, the sliding into home. But a closer glance at this field in Philadelphia's Fairmount Park shows something isn't quite right. They're pitching underhand. No one is using a batting helmet, fielding glove or catcher's mask. And what's up with those floppy hats and groomed mustaches? "Striker to the line!" bellows a man wearing a straw hat, suit and bow tie. This is not your father's baseball. Or even your grandfather's baseball. It's your great-great-grandfather's game. The Athletic Base Ball Club of Philadelphia plays America's favorite pastime the old-fashioned way. 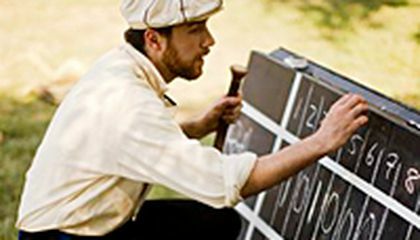 It's one of a growing number of teams nationwide that recreates the 19th century through historically accurate uniforms, period rules and cheeky nicknames. And by spelling "baseball" as two words. 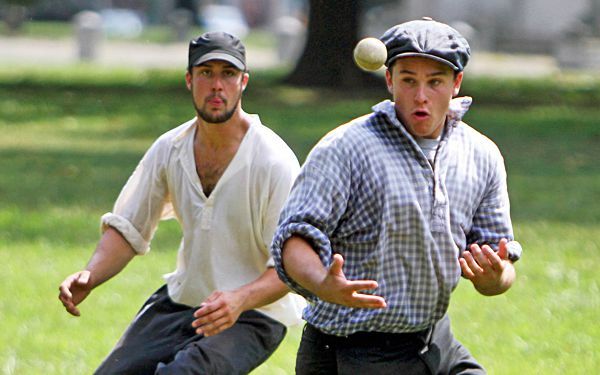 "It brings people back to a simpler time, before million-dollar contracts, TVs, cars, steroids and gloves," said Mid-Atlantic Vintage Base Ball League commissioner Bruce "Early" Leith. Leith, who is never early, also serves as president of the Eclipse Base Ball Club of Elkton, Maryland. Eight years ago, he said, there were only three teams in that area. Today, there are 14. "We get calls all the time from people wanting to start a club," said Leith. Baseball mythology has long held the game was invented in 1839 by Abner Doubleday in Cooperstown, New York. But researchers now say its regulations began to be codified in the 1840s by Alexander Cartwright and the Knickerbocker Base Ball Club of New York City. Those bylaws were frequently revised, giving today's vintage teams a variety of old rulebooks to choose from. The Mid-Atlantic league, which includes the Athletic and about 20 other squads from Rhode Island to Virginia, plays by what are called the 1864 rules. One of the biggest differences between then and now is that fielders could catch a batted ball on one bounce to make an out an understandable accommodation for players trying to handle a hard ball without gloves. Such equipment didn't become common until later. The Athletic club, named after the Philadelphia team founded in 1859, formed about five years ago after co-founder Scott "Big Deal" Alberts started researching the sport's deep roots in the city. His teammates, called "ballists," comprise a range of ages, athletic ability and occupations. The squad sets a high standard for historical accuracy during its weekly games. Their wool uniforms, which cost about $300, include mother-of-pearl buttons, a bow tie and newsboy cap. Home plate is a white disc, the bases are sand-filled canvas bags, and the beer has been brewed from a 19th century recipe. "We try to do everything we can as close as possible to the period," Alberts said. "Because if we're not doing that, we might as well just be playing softball in the park." "I love that ... they're trying to be authentic by drinking out of canteens and tin cups," said Alice Best of Lancaster, Pennsylvania, a spectator. "And they have their bats in a barrel, or on an old wooden rack. It's really, really nice." Not all teams are such sticklers for authenticity, said Dennis "Pops" Wiegmann, president of the National Vintage Base Ball Association. The organization has about 65 active clubs some dating to the 1980s and he estimated dozens of other teams are unaffiliated with the group. But all share a common goal: exercise and camaraderie with a historical twist. "It gives people another way of looking at the game," Wiegmann said. It gives people another way of hearing the game, too. Frequent phrases from the umpire sometimes called the arbiter include "Tally!" as a runner scores and "The striker is dead!" when a batter makes an out. Being a baseball player, i really enjoy this article, it brings back baseball to its roots and its very interesting to me, i would like to watch this in person at one point in my life or even play in an old fashion league. very great idea! a person like me who loves history would like to be able to feel what our ancestors felt. also a very fun and informational way to play. after the game you could reflect on how different the sport is today. i would love to play the sport like they did back then... i might also think it would be more fun! It's interesting to here about people playing old fashion base ball. May be one day I want to play old fashion base ball it sounds fun using no gloves, nor helmets, but for now I'm just sticking to modern day baseball, and backyard baseball. i have experienced the way these people used to play. As now i never got to play like this with my great grandfather because they are both resting in peace. but i think that bringing back this game would be dangerous because they are not wearing any protection. they don't wear any baseball gear like the helmets. I think this would be a great way for people to get off the couch instead of watching the Phillies vs Reds game and actually see what the game looked like before Derek Jeter, Barry Bonds, and Ryan Braun were slugging home runs. Back then, people would only play because they loved the sport. Nowadays, these men are playing for the fame, money, and publicity. If more people knew about this club organization, more people would be playing in this league, not just playing catch while tailgating before the Cubs take on the Cardinals. I would love to play sports like they did in the old days. It would be a little more difficult with out all the protection but it would be a fun game to play on a nice hot sunny summer day.